Owner claims that any Royal Enfield can be made to look like a Pegasus 500 or a Classic 350 Signals Edition by spending just a few hundred rupees. Royal Enfield Pegasus 500 was launched in July this year. With only 250 units on offer, it managed to go out of stock within 3 minutes of getting launched. To be precise, all 250 units of Pegasus 500 were sold out in just 178 seconds in India. Pegasus 500’s exclusivity caused a storm among those interested. But there was nothing much that can be done as the motorcycle was a limited edition, and all 250 units were gone. There were thousands of Royal Enfield fans who were left disappointed because of this. But, within a month of launch of Pegasus 500, Royal Enfield launched a similar looking Classic 350 Signals Edition. This one came with a similar design like Pegasus 500, including the unique number on the fuel tank. Though this made those who did not buy the Pegasus 500 happy, it made some of the Pegasus 500 owners angry – as their motorcycle was no longer exclusive. But what about existing Royal Enfield owners, who too are interested in the Pegasus styled design? Well, there is a solution for this as well. 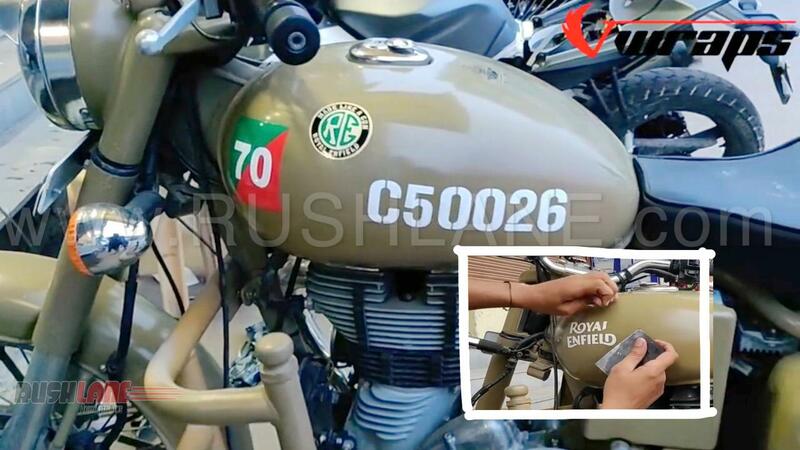 For a few hundred rupees, one Royal Enfield 500 Desert Storm owner claims to have converted his bike into a Pegasus 500 The same has been showcased in the video above, which was made by Youtube channel Vwraps Sikar. In case you are not able to watch the video above, head here. The video shows how the company fitted sticker and tank pads were removed with the help of a blade. The surface was polished, and was replaced with the Pegasus 500 stickers, along with the stencilled unique number. The entire job can be done in a few hundred Rupees. This is a simpler and easy solution for those Royal Enfield fans who want to convert their motorcycle into a Pegasus 500 or Classic 350. This aftermarket job is only for the stickers on fuel tank. It does not paint the engine, which is in the case of Pegasus 500, or adds dual channel ABS, which is in the case of Classic Signals 350.